Forest fires are breaking out in the Sabangau peat-swamp forests in Central Kalimantan, Indonesian Borneo, threatening the lives of the estimated 8,000 wild orangutans living here. This is exceptionally worrying during times of extreme drought caused by El Niño. This year Borneo is once again firmly in the grip of such a drought. During previous El Niño years several hundred thousand hectares of primary rainforest burnt in this area, destroying the habitat of thousands of orangutans and other endangered plants and wildlife. According to Dr. Suwido Limin, Director of the Indonesian peatland conservation organisation CIMTROP, management of the forest by forestry companies over the last forty years has led to the loss of forest rights for local people. In order to restore the local community’s engagement with the forest, these rights need to be returned. Dr. Limin has witnessed out of control fires many times before and is concerned that 2009 will see a repeat. He has spent the last twenty years studying and protecting this unique ecosystem and knows very well the risks involved. 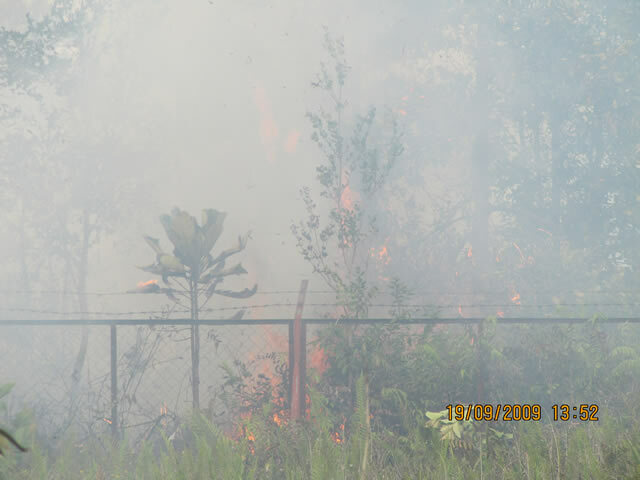 These fires have started as a result of human actions; newcomers to the area have attempted to follow traditional Dayak farming methods for land clearance but they lack the experience to control the fires they start. When peat dries out it burns very easily and at great temperatures. Once these fires take hold, they burn and burn and can be almost impossible to put out until the rains come again. In that time huge areas of forest and irreplaceable peat deposits may be lost. 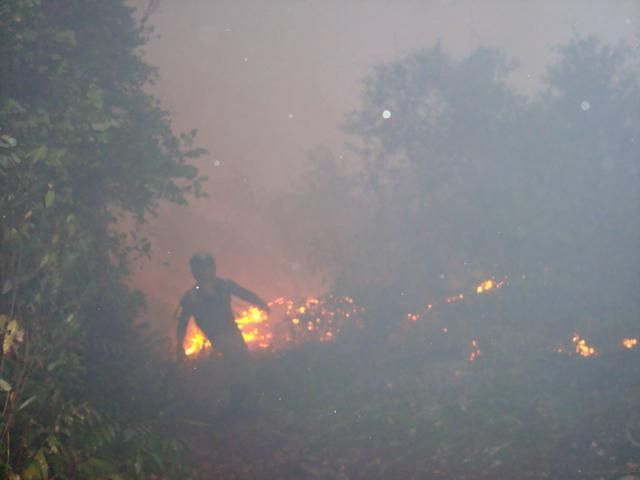 Peatland fires are not only a major threat to the natural environment and the many species that live here but also to the health of the local population due to smoke inhalation. Nationally, huge clouds of smoke are blacking out the sun, affecting air and sea traffic and potentially causing millions of dollars of lost revenue. On a global scale, they are one of the largest sources of carbon dioxide and other greenhouse gas emissions, which contribute significantly to rising global temperatures and hence climatechange. To try and prevent this happening, CIMTROP run a rapid-response fire-fighting team (locally known as the Tim Serbu Api, or TSA) to tackle fires as soon as they are reported and before they get out of control. The team monitors an area of 100,000 hectares and is made up of local people who have received training and equipment from CIMTROP and are ready to be called upon when fires break out. But, as Dr. Limin reports, this is a hazardous job. Peat fires are unique as they spread below the surface, on average 20-30cm below ground but sometimes as deep as 60cm, which makes fighting them both dangerous and unpredictable. You can put out fire in one place and then flames suddenly shoot up behind you. 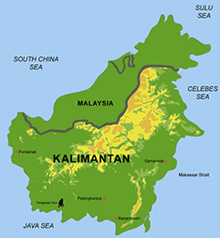 One fire hotspot is Kalampangan which borders both the NLPSF (the Natural Laboratory for Peat Swamp Forest), an international research site established by CIMTROP, and Sabangau National Park home to the world`s largest orang-utan population. CIMTROP?s fire-fighting team have been battling fires in Kalampangan non-stop for the past ten days and will continue to monitor the fires until the rains come. Local residents report the fire took hold incredibly quickly, raging through the tinder-dry vegetation, decimating all in its path and burning down into the peat. Here orangutan sleeping nests can be seen in trees shrouded in smoke and rhinoceros hornbills fly through the haze overhead. On the ground, the TSA create fire breaks and pump water from nearby canals and bore-holes onto the fires. Bore-holes often need to be twenty meters or more deep to access sufficient water to tackle the fire, taking up to six hours and teams of three or four trained workers to dig. Extinguishing just one square metre of burning peat takes two to three hundred litres of water. Alim, a long-term TSA team member, is enthusiastic to talk about their work and what they need. ?We use water pumps and special fire-fighting hose to carry water from the water bores and canals to the burning areas. At the moment, we have twenty TSA rapid-response fire suppression team members, all fully trained specialists in fighting peat fires. They work alongside ten more people split between the River Patrol Team (Tim Patroli), which carry out daily patrols along the boundary of the NLPSF using the Sabangau river, and the TSA Ground Patrol Unit who use motorbikes to monitor the forest from the land. All our teams keep in contact with each other using two-way radios. Of course, it would be great if we could have more equipment so we can cover more ground. Ideally, I would like sixty permanent TSA members so we can set up more fire-fighting points working simultaneously in this fire hotspot while also allowing the team to get some rest! We need more water pumps, lots more hose and permanent bore-hole sites so we can channel water to burning areas more easily. Unfortunately, one of our patrol bikes was destroyed in the Kalampangan fire making patrolling much harder. Dr. Limin is proud of his team and their dedication in such difficult conditions. In 2006 they battled successfully for five months to save an area of pristine forest, and he expects a similar commitment this time around. But he echoes Alum’s calls for more equipment and personnel. It is difficult to maintain funding for the TSA over the long-term because major fires occur maybe once every three or four years. We need to have the capacity to guarantee income and operational costs for the TSA and Tim Patroli and have funds permanently available for immediate use when fire hits. Disasters do not wait while mitigation strategies are discussed and put in place; they hit hard and fast, with little warning. We rely on donations, and are very grateful for the financial support we receive, but at the moment we simply don’t have the resources we need to tackle all the fires that are starting.